Dr. Chopra began his career as an endocrinologist and later shifted his focus to holistic medicine by integrating the ancient wisdom traditions of the East with traditional Western medicine and recent discoveries in the field of quantum physics. He has forged a holistic approach to healing that has had enormous popular appeal as well as widespread professional acceptance. Dr. Chopra is board-certified in internal medicine and specialised in endocrinology and is also a member of the American Medical Association (AMA), a Fellow of the American College of Physicians and a member of the American Association of Clinical Endocrinologists. Dr. Chopra is transforming the way the world views physical, mental, emotional, spiritual, and social wellness. Chopra was born in New Delhi, British India. His father was a prominent Indian cardiologist, head of the department of medicine and cardiology in New Delhi for over 25 years and a lieutenant in the British army. Chopra was raised in a family infused with both Western medicine and spiritual beliefs and practices. His paternal grandfather was a sergeant in the British Army who looked to Ayurveda for treatment for a heart condition when the condition did not improve with Western medicine. Sanjiv Chopra, Deepak Chopra’s younger brother, is now a professor of medicine at Harvard Medical School and has several publications and five books to his credit that have been translated in several languages. As a senior student in Delhi’s St Columbus School, Deepak was a good writer and an eloquent speaker. As a young man, Chopra’s desire was to become an actor or journalist, but he reports that he was inspired by a character in “Arrowsmith” by Sinclair Lewis and became a doctor. Chopra completed his primary education in New Delhi and received his medical degree from the All India Institute of Medical Sciences (AIIMS). While still at AIIMS, he saw the flaws in mainstream medicine. Once, he said: “I thought that they would talk about health, but they talk only about disease.” It was probably the beginning of his disenchantment with the traditional mould of modern medicine and a rediscovery of India. Despite his rising career, Chopra became disenchanted with Western medicine and its reliance on prescription drugs. The work began to wear on the promising doctor, who would later claim that he smoked up to a pack of cigarettes a day and drank consistently to relax. He was counselling his patients to change their self-destructive habits, but began to recognise that he could not make such changes in his own life. Eventually overcoming his previous biases against the mysticism of his native India which might hold the key to alleviating his stress, in 1981 Chopra became receptive to the message of Meditation, Yoga and Ayurveda. He was particularly impressed by the sizeable amount of research that proves that the daily practice of meditation reduces stress. Within two weeks he stopped smoking and drinking and eventually changed his career path. “At first I did meditation mainly to relax, but it changed my whole life—my diet, my work, my relationships with patients and other people,” he says. “I became 10 times more efficient in my work.” He soon lost his taste for alcohol, and other self-impairing habits spontaneously fell away. As his interest in alternative medicine deepened, so did his view on the limits of Western medicine. Dr. Chopra and his wife went on to learn the advanced meditation techniques. In 1985, Dr. Chopra met Maharishi Mahesh Yogi who invited him to study Ayurveda. 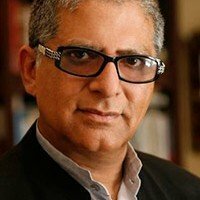 In that same year, Dr. Chopra left his position at the New England Memorial Hospital and became the founding president of the American Association of Ayurvedic Medicine, and was later named medical director of the Maharishi Ayurveda Health Center for Stress Management and Behavioral Medicine. Dr. Chopra was a top assistant to Maharishi Mahesh Yogi before following his own path in the early 1990s by publishing self-help books on mind-body medicine, wellbeing, health, spirituality and alternative medicine. By 1992, Dr. Chopra was serving on The National Institutes of Health Ad Hoc Panel on Alternative Medicine. In 1993, Chopra became executive director of the Sharp Institute for Human Potential and Mind–Body Medicine with a grant from the Office of Alternative Medicine in the National Institutes to study Ayurvedic medicine. Dr. Chopra moved with his family to Southern California where he now has a home with his wife near his two adult children, Gotham and Mallika. That same year, Dr. Chopra and Dr. David Simon founded the Chopra Center for Well Being, to offer educational programmes to nurture body, mind and soul. Most of the Chopra Center’s workshops, seminars and events aim at providing tools and resources to foster physical healing, emotional wellbeing and spiritual awakening. Almost all of these programmes incorporate Meditation, Yoga and the ancient wellbeing system of Ayurveda. The University of California, San Diego, School of Medicine and American Medical Association have granted continuing medical education credits for some programs offered to physicians at the Chopra Center. Since meditation is at the core of all the educational offerings at the Chopra Center, Dr. Chopra and Dr. Simon revived an ancient mantra-based meditation practice, traveling to India to study the origins of this technique, known as Primordial Sound Meditation. This form of meditation is now taught at the Chopra Center and by certified instructors worldwide who receive their training through Chopra Center University (CCU). The Chopra Center University was created to educate and train people to gain mastery and provide formal instruction in disciplines such as Meditation, Yoga and Ayurveda. 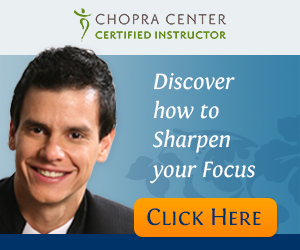 Since its inception, the Chopra Center University has created a widespread community of international certified teachers of mind-body balance who support the physical, emotional and spiritual transformation of thousands around the globe. In 2005 Dr. Chopra was made a Senior Scientist at The Gallup Organization and Adjunct Professor at Kellogg School of Management. Dr. Chopra regularly lectures at Harvard University’s Divinity School, Medical School and Business School and is also a Distinguished Executive Scholar at Columbia Business School, Columbia University in New York. In 2009 Chopra established the Chopra Foundation with a mission to participate with individuals and organisations in creating a critical mass for a peaceful, just, sustainable, and healthy world through scientifically and experientially exploring non-dual consciousness as the ground of existence and applying this understanding in the enhancement of health, business, leadership and conflict resolution. The Chopra Foundation is dedicated to improving health and well being, cultivating spiritual knowledge, expanding consciousness, and promoting world peace to all members of the human family. In 2010 the Chopra Foundation sponsored the first Sages and Scientists Symposium with prominent scientists philosophers and artists from around the world. Dr. Chopra is also a weekly columnist for the San Francisco Chronicle, a regular contributor to the Washington Post and a prolific contributor to the Huffington Post. Dr. Chopra now resides in New York city. In 1995, Dr. Chopra was the recipient of the Toastmasters “International Top Five Outstanding Speakers” award. In 1997, Dr. Chopra was given the Golden Gavel Award by Toastmasters. Dr. Chopra was presented with the Medal of the Presidency of the Italian Republic awarded by the Pio Manzu International Scientific Committee. In the citation, committee chairman and former Soviet premier Mikhail Gorbachev referred to Chopra as “one of the most lucid and inspired philosophers of our time”. Esquire magazine designated him as one of the “top ten motivational speakers in the country”.